why can't the same effort be made in improving the safety of our roads as is made on improving the safety of the cars that drive on them? Cars are safer than they've ever been. Sadly, we can't say the same about the roads we drive them on. Recently, the biggest study ever undertaken on the safety of Europe's roads has identified the most dangerous major road in Britain as the A889 near Dalwhinnie in the Scottish Highlands. Following 18 months of work, the AA-led EuroRAP (European Road Assessment Programme) has given safety 'star ratings' to more than 800 major UK roads, and a further 2,000 in three other countries - the Netherlands, Sweden and Spain. The unique statistics will allow highways authorities and engineers to compare similar roads and identify the hidden killers among them. It is estimated that often simple improvements to those stretches that perform worse than average could save 2,400 people in Britain from death or serious injury each year. This is equivalent to more than a third of the fatal and serious accidents that happen on these roads. The A889 has an accident rate almost double that of the next most dangerous road, the A537 from Macclesfield in Cheshire to Buxton in Derbyshire, while the third most dangerous road is a short section of the A12 between Romford in Essex and the M25. Of the 833 roads assessed in the UK, 23 were so bad they achieved no stars in the ratings. 90 only received one-star, 213 two stars, 415 three stars, with 92 gaining the top four star rating. Roads with no stars have accident rates ten times higher than the best performing roads in the four star category. An average road scores between two and three stars. Experts from 13 European nations and four governments have so far co-operated on the project, designed to help the EU in its aim to halve the number of people who die on Europe's roads each year by the end of this decade. The death toll is currently 40,000 a year, equivalent to an airline disaster happening every day. Britain, despite the best safety record in Europe, still sees around 3,400 deaths a year. EuroRAP shows the safety performance of the routes in relation to the amount of traffic they carry, not just the number of accidents that happen on any given stretch. This gives an accurate picture of the true risk to drivers and other road users. This will then allow designers to make changes to lessen the risk of the four major killers - head on crashes, accidents at junctions, collisions with vulnerable road users such as pedestrians and cyclists, and vehicles hitting objects at the side of the road. Each year in Germany, 1,600 people die from crashing into trees, while 800 die in the same type of accident in France. In the UK, 500 people die hitting trees, lampposts, signs and other roadside hazards. Says John Dawson, AA Policy Director and EuroRAP Chairman: "We have to make roads more forgiving - everyday human error shouldn't carry a death sentence. People should not be dying on major routes because basic protection is absent from entirely predictable collisions, such as with unfenced roadside objects. 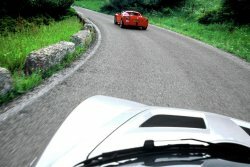 "The EuroNCAP car crash test programme has done wonders for car occupant safety in a few short years, but we have some major roads around Europe which fall so far short of known safe design that they give little margin for survival in the event of a simple driver error, whatever car you're in. We cannot demand five-star cars from manufacturers and then settle for one-star roads. The cars we drive, the way we drive and the roads we drive them on are all part of a single safety system." And he adds: "In three years, most of the roads we have examined have seen death and serious injury on a scale that if they occurred in a rail disaster would generate national headlines and soul-searching. Yet road deaths are often cheap to avoid by comparison." The EuroRAP programme is concentrating, in its first phase, on primary-route A-class roads outside built-up areas - many of which are single-carriageway roads - and motorways. The British sections total 14,000 miles, where there were 20,000 fatal and serious injury accidents in the three year period covered. In recent times, experts have driven down sample sections of the networks in Britain, the Netherlands, Sweden and Spain, videoing and testing them mile-by-mile in an effort to understand why some have higher rates of death and serious injury than similarly-trafficked stretches elsewhere. The initial work has shown that the Netherlands and Sweden have death rates very similar to Britain, but that in Spain, the rates on comparable roads are three to five times as high. Soon, EuroRAP's work will continue in these countries and extend to three others, likely to be France, Italy and Ireland.